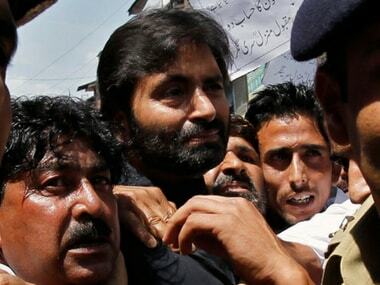 Srinagar: JKLF chairman Mohammad Yasin Malik was on Wednesday arrested and sent to Central Jail here while moderate Hurriyat Conference chairman Mirwaiz Umar Farooq was placed under house arrest. Malik was arrested by police from JKLF office at Abi Guzar and sent to judicial remand, a spokesman of the separatist outfit said. 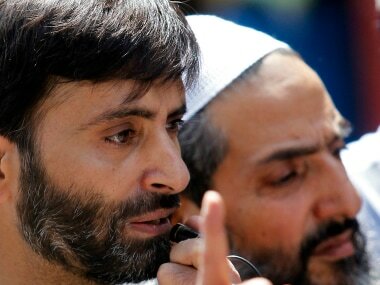 Before being taken away by police, Malik attacked the ruling PDP and BJP, saying they had tried to "deceive" the people with "sugarcoated slogans like healing touch, battle of ideas and no bullet but talks". In a related development, Mirwaiz was placed under house arrest. Police, however, did not give reasons for the action. Meanwhile, the separatists under the banner of Joint Resistance Leadership—which comprises Malik, Mirwaiz and Syed Ali Shah Geelani—have called for a shut down in Sopore town of north Kashmir on 6 January.